Hereditary Elliptocytosis (HE), also known as ovalocytosis, is a disorder of the red cell membrane inherited usually in an autosomal dominant pattern. In this condition, the majority of cells have an elliptical shape. The osmotic fragility is normal. HE is due to defects in either the structure or quantity of the cytoskeletal proteins responsible for maintaining the biconcave morphology of RBCs. Mutations in either alpha- and beta-spectrin are most commonly responsible, but mutations in other cytoskeletal proteins (band 4.1 and glycophorin) are also described. Elliptocytosis affects about 1 in every 2,500 people of northern European heritage. It is more common in people of African and Mediterranean descent. Most affected individuals are asymptomatic, though mild anemia, jaundice, splenomegaly and leg ulcers can occur. Laboratory studies may show evidence of hemolysis, such as low haptoglobin levels; a high reticulocyte count; and elevated concentrations of lactic dehydrogenase (LDH) and indirect bilirubin. It is important to emphasize that the percentage of elliptocytes observed does not correlate with the severity of hemolysis. Ultrasound of the gallbladder may show gallstones. 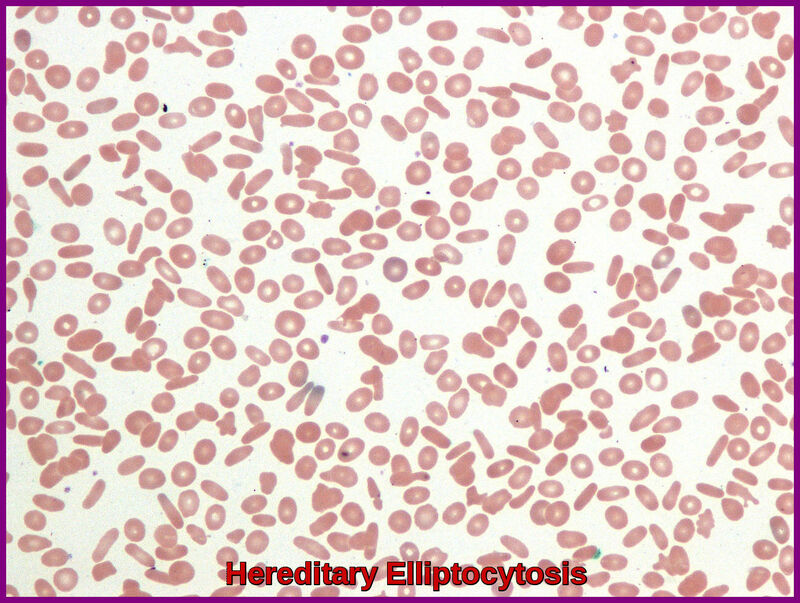 The diagnosis of hereditary elliptocytosis is usually made by coupling a family history of the condition with an appropriate clinical presentation and confirmation on a blood smear. 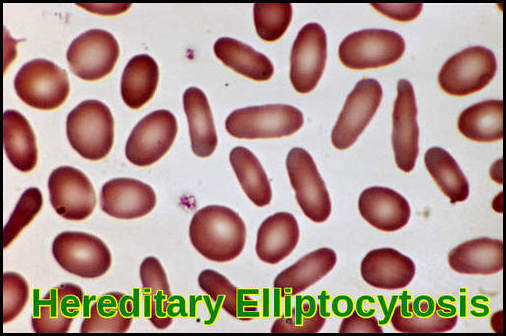 In general, it requires that at least 25% of erythrocytes in the specimen are abnormally elliptical in shape (cigar-shaped) though the observed percentage of elliptocytes can be 100%. This is in contrast to the rest of the population, in which it is common for up to 15% of erythrocytes to be elliptical. Results of osmotic fragility testing are within reference ranges in typical HE, but values are increased in spherocytic HE. The vast majority of those with hereditary elliptocytosis require no treatment whatsoever. They have a mildly increased risk of developing gallstones, which is treated surgically with a cholecystectomy if pain becomes problematic. Folate helps to reduce the extent of hemolysis in those with significant hemolysis due to hereditary elliptocytosis. Splenectomy is only considered in severe symptomatic cases. Elliptocytes can occur in many other conditions (eg, iron deficiency, leukemias, megaloblastic anemias, myeloproliferative diseases, myelodysplastic syndromes) but usually do not reach the proportions observed in patients with HE. Gallagher PG. Hemolytic anemias: red cell membrane and metabolic defects In: Goldman L, Schafer AI, eds. Cecil Medicine . 24th ed. Philadelphia, Pa: Saunders Elsevier; 2011:chap 164. Da Costa L, Galimand J, Fenneteau O, Mohandas N. Hereditary spherocytosis, elliptocytosis, and other red cell membrane disorders. Blood Rev. 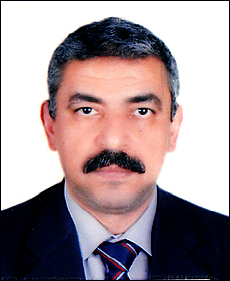 2013 Jul. 27(4):167-78. King MJ, Garçon L, Hoyer JD, Iolascon A, Picard V, Stewart G, et al. ICSH guidelines for the laboratory diagnosis of nonimmune hereditary red cell membrane disorders. Int J Lab Hematol. 2015 Jun. 37 (3):304-25. Hereditary Elliptocytosis (also known as ovalocytosis) is a disorder of the red cell membrane inherited usually in an autosomal dominant pattern. Thank you for contacting me. Generally speaking, most patients with hereditary elliptocytosis (HE) do not require medical treatment. A diet rich in folic acid or folic acid supplementation is recommended to avoid consequences of folate deficiency in a hemolytic state. Other supportive measures, such as blood transfusions, may be indicated if the anemia is severe. Splenectomy markedly improves anemia for patients with clinically significant hemolysis. Splenectomy stops or markedly reduces hemolysis that results from HE but does not correct the underlying membrane defect. As long as your son’s hemoglobin is stable and he has no frequent hemolytic crisis he will not require any treatment.